Visit Us Or Book An Event Today. Come and enjoy our indoor family entertainment center for your next birthday party or special event. Kids of all ages can come and jump on our bouncers, race thru the obstacle courses, speed down the mega slides, slam dunk into the basketball hoops, and much more. When you book a party with us we handle all the details. We provide a personal host, full set-up and clean-up, all the tableware, invitations, and drinks for the guests. All you have to do is bring the cake & candles, decide your food options and you’re ready to go. You can send in a Party Reservation Form from this site or call 562-270-4179 7 days a week from 10am to 6pm, but parties can be held throughout the day from 9am to 9pm. Families of Military, Fire, Police, Teachers, and Nurses receive a 10% discount. Parents accompanying children are free. Each additional adult is $5. Always check our Calendar of Events for Open Play availability, private events, and holiday hours. Parents and guardians are always FREE, but everyone including the adults MUST be wearing socks, there are NO SHOES allowed inside the Jumpspace. To keep our facilities as clean as possible we do NOT allow outside food during Open Play. Drinks are OK. If you are looking for a fantastic place to take your kids in order to have the best experience possible for their birthday, you should go to Jumper’s. It is an exciting place for kids that are younger, although older ones might feel tempted to get on all of the inflatable bouncing equipment. 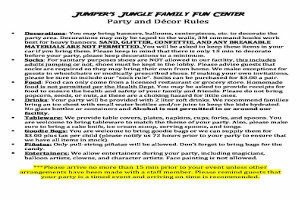 Here is a quick overview of what you can experience at Jumper’s Jungle and why you should consider this as the next place that your child has their birthday. Jumper’s Jungle it is the ultimate place for kids that want to have fun on their birthday. If you are in La Habra, Peoria, Las Vegas, or Santa Fe Springs, these are all locations where you can have one of these birthday parties. This is a company that specializes in this jungle themed that is so preferable to so many people. If you have never been to a place like this before, you will be astounded by the professionalism and the many different activities that are made available for the children. One of the reasons that you will like this place so much is because of the super slides that kids can go on, the obstacle courses, the jungle bouncers, and many other inflatable games that are available. It is a destination that will also provide you with pizza and sodas depending upon the package that you choose. One of the reasons that you should consider going here is that this business is exceptional for several different ways. First of all, it is very unique in comparison to the many other companies that offer this type of service. You may have been to other locations that provided parties for your kids before, but this is going to astound you. The reason that you will like it so much is that there is literally an indoor playground, perfect for kids that are having their birthday planned when it is going to be stormy weather. You will be safely inside with not only your kids, but all of their friends that will come after they receive a birthday invitation from this company. The different places to play including sports games, bouncers, slides and obstacles all made of inflatable materials will motivate kids to play for well over an hour. In fact, there are different packages that you can choose starting at 90 minutes, going all the way up to two hours in most cases. You can pay for extra time if you want to, if it is available, something that you will have to ask them either before you arrive or right at the end of the party. These activities are going to tire everyone out and give you plenty of time to set up the birthday party with their cake. You will need to bring utensils, plates, cups, and the birthday cake that you are going to provide for the kids. Anything that you bring must be store-bought, and as long as it comes from a local store, everything’s going to be fine. This could be cake, ice cream, and all of the juices and soda that you need to bring to accommodate all of the visitors. The ideas that you come up with could be catering to what your kids like the most. They might want to have a party that is designed around superheroes. That would actually be perfect for this jungle theme because they could pretend they are jumping around, saving someone, or even using their superpowers. The different parties that you can select start with the Premier Party which is 90 minutes long and will be shared with another group. If you want something private, the have VIP parties, both regular and deluxe, with prices ranging between $225-$425 on the weekends and Fridays. All of the fun activities are not just designed for the kids. If there are older kids that are 17 years or younger, they will be part of the headcount. You can have up to 30 kids at a time, and they will all enjoy playing on these many inflatable items. There is actually a play area for toddlers, kids that are less than a year old. This is also designed for kids that would not want to jump around with all of the older ones. The main part of the birthday party complex however is the slides and laces to jump. As long as everyone is around the same age, there shouldn’t be any apprehension at all. Additional party ideas to consider are bringing games. You can have them play games and rotate them in as they get done with the jumping activities. Essentially, you can have the exact same party that you have envisioned with the primary benefit of having more room, and have pizza and sodas served as part of your package. The things that you will like the most is that it is designed just for kids. It is as if a child had designed the place and you will see that everyone will enjoy themselves in this unique location. It is a destination that is very special for children that may have never had such a unique birthday party before. You will probably want to come back after experiencing all that Jumper’s Jungle has to offer. If you do have a toddler, they can still have a lot of fun. You can rent it out for kids that are their age. Even if you only have a couple of kids coming, you are going to be more than happy with the accommodations. As far as birthday parties go, this is going to be the perfect place for kids in La Habra County, especially when they get excited and they need to burn off all that energy. They will be going up and down the slides, plus jumping around most of the time, until it is time to sing happy birthday and serve the cake and ice cream. You can schedule this anyway that you want. The kids can eat at any time. It is your party and you can do as you wish while you are there. The only requirements are that all of the kids and adults wear socks that are going to be going into the area where the inflatable items are so as to prevent injuries and also protect those items from being punctured. The party ideas that most people come up with are going to work just fine with this business that will make your child’s day. There is nothing more fun than having an entire room filled with inflatable items that they can bounce on, expending all of their energy. If you have never taken your kids to Jumper N Rentals in La Habra before, they are going to be in for quite a treat. Whether they are kindergartners, or much older than that, they are going to have fun out this incredible location. It is highly recommended that you call several weeks in advance to make sure that you get a slot in. If there are any problems, you can always reschedule as long as you are two weeks out. Call Jumper’s Jungle today.